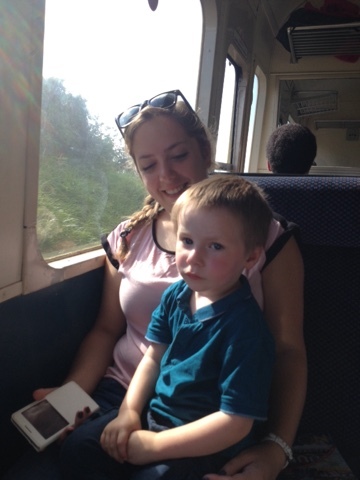 Little W is three years old and is obsessed with trains, boats and buses. A day trip involving all three would surely be a winner. 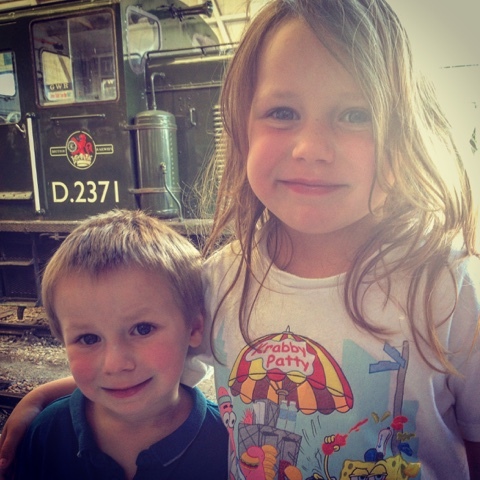 So earlier this week we took my mother (who loves steam trains) and our au pair (who loves the Devon countryside) on the Dartmouth Steam Railway and River Boat Company Round Robin trip. It was an eventful day. But more of that later. First I'll explain the trip. The direction of travel depends on the tides as the water needs to be high enough for the boat to travel along the River Dart. 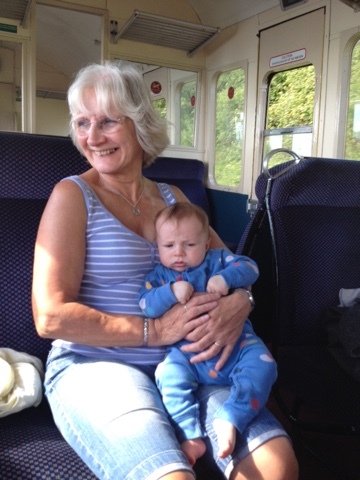 We began our trip by taking a regular train to Paignton. The steam train station is next door, right in the town centre. So as we transferred from our modern(ish) diesel train and wandered next door into the ticket office of the Dartmouth Steam Railway, it was like stepping back in time to an age when steam engines powered the world. We bought a family ticket, which covers two adults and up to three children. Under 3s are free, but must be 'declared'. It was a lovely touch that our very own under 3 (baby O) was given his own special 'My first round robin' ticket to commemorate the occasion. Our train departed at 10am. The route is beautiful as the railway follows the coast out of Paignton along through Goodrington Sands before dipping inland behind Churston, past Agatha Christie's house at Greenaways before hugging the River Dart back down to the coast. It's well worth hanging around on the platform when you arrive in Kingswear to watch the steam engine unhook from the front and chuff round to the other end of the train for the return journey. Outside the station you follow the ramp down to the river to get the ferry across to Dartmouth, which runs every 10 minutes or so. Dartmouth is a beautiful town with lots of lovely shops - including a SeaSalt samples and sale shop which is great if you are a Size 10! We wandered through the shops and along the river wall where lots of families were enjoying a spot of crabbing and enjoyed lunch in a fish and chip shop before heading back down to the quayside for our 2.45pm River Dart cruise. It was at this point that the day took an interesting turn. We decided to pop into the supermarket for some extra food supplies for the next stage of the trip (strawberries and a packet of biscuits). 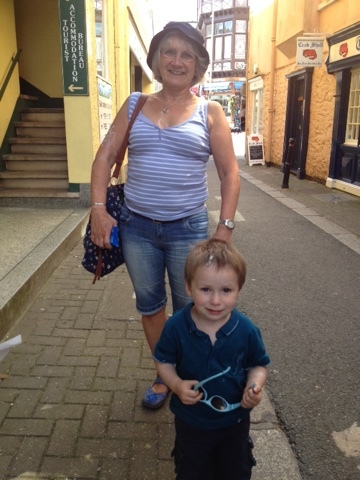 Little W was being carried by his grandmother when a seagull decided to spatter them with epic proportions of droppings. They were absolutely covered. Obviously, before digging out wet wipes to try and cleanup the mess, I stood in fits of laughter and grabbed my camera! Karma meant that I only managed to get one photograph before the battery went. If you look closely, the seagull managed to get W's hair and shirt and my mum's arm, cleavage, hat, bag and vest. Once we had cleaned them up as best we could, we went down and boarded the boat. We opted for the open air top deck for the best views (although I did regret failing to bring a jumper as the wind was fairly fresh at times). The commentary on board was interesting and pretty amusing. Our skipper had a very dry sense of humour. We looked out for some seals, but only managed to spot a few herons. However, the scenery was beautiful and it was a really relaxing way to spend an afternoon. Things began to go wrong when we got to Totnes. The plan was to get straight on the bus back down to Paignton as we were planning to head to the carnival back in our home town later that evening and we wanted to grab some supper before the procession. Unfortunately, everyone else on the boat had the same idea and by the time the bus arrived (20 minutes late), there were more passengers than seats, so a group of around 20 of us were left behind. We were promised that an additional bus was on route, but given no assurances about how long this would take. So we waited, and waited, and waited. Luckily Baby O is pretty chilled out for a 16 week old baby. And the rest of us were happy to take advantage of the adjacent ice cream shop. An hour later (about 5 minutes before the scheduled last bus), a 'relief' bus arrived. By this point, the queue was really long again so by the time we'd all clambered on, there were still passengers left waiting. As we boarded the bus, I joked that all we needed now was for this bus to break down. And yes, you've guessed it, two miles out of Totnes and the bus broke down. Luckily, this time, we only had to wait about 25 minutes for what was the original bus to pass by and we were able to resume our journey back to Paignton. We got back with one minute to spare before our train home, so we hot-footed it through the station and over the footbridge with seconds to spare and got back just as the carnival procession started. If all the transport had gone to plan, this would have been a perfect day. Although the boat trip is a little long for toddlers and the top deck of the boat is pretty precarious. You need to make sure they stay sat down in their seats and I was holding on to baby O very, very tightly! But sometimes the best memories are when things don't go to plan. And I don't think little W will forget the time the bus 'breaked down'. What are your favourite day trips in Devon?